Nationally acclaimed pastry chef, restaurateur, cookbook author, teacher, and television personality. 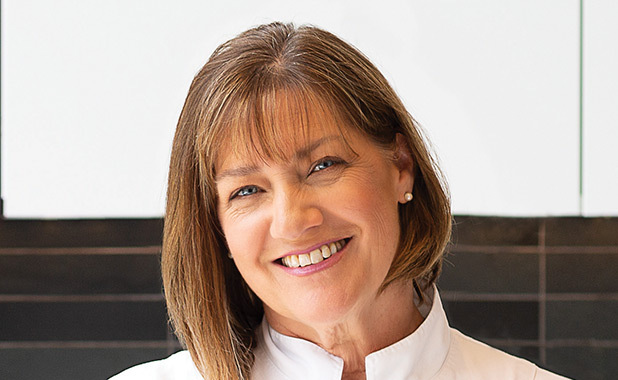 Gale Gand has received two James Beard Awards, was inducted into the Chicago Chefs Hall of Fame, and co-founded and partnered in the renowned Chicago restaurant TRU, which had two stars from the Michelin Guide. She is also the author of eight cookbooks, including her latest, Gale Gand’s Lunch! Gand’s first national television appearance was with Julia Child in the 1995 PBS series Baking With Julia. She went on to host Sweet Dreams, Food Network’s first program devoted to desserts, for eight years. She continues to appear regularly on television and has appeared on Top Chef, Iron Chef, The Oprah Winfrey Show, Martha Stewart Living, Rachael Ray, and many others. Gand teaches cooking and baking at culinary schools across the country as well as online at craftsy.com. She can often be seen cooking at food and wine festivals, on cruises, and at charity events around the world. She recently developed a honey Sriracha–flavored jerky for Think Jerky, and her artisanal soda pop, Gale Gand’s Root Beer, has been sold nationally for more than 20 years. She began her career as a musician before becoming a silversmith with a BFA in metalsmithing from the Rochester Institute of Technology. She later attended the La Varenne cooking school in Paris. A wife and mother of three, Gand paints and plays the ukulele in her spare time.